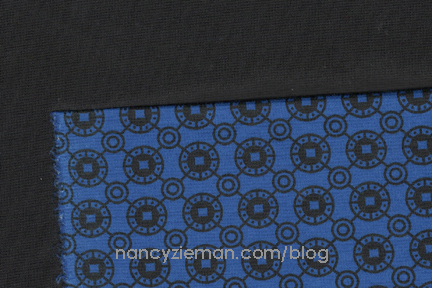 Welcome to the first day of the Nancy Zieman Knit Dress Sew Along! I’m glad you are joining me to sew McCall’s M7152. The dress is a great addition to any spring wardrobe. Today’s focus is on fabric and interfacing choices, yardage, and pattern cutting directions. Gather the supplies listed on the back of the McCall’s pattern envelope. For the sew along, I am creating the dress with a contrasting yoke. Klasse Ball Point Needle, Size 80/12. Use the back of the pattern envelope to determine your required yardage. As you may know, the size listed for sewing patterns is different than the size worn in “off-the-rack” clothing. Sewing pattern sizes are based entirely on your body measurements. Grab a tape measure and jot down your Bust, Waist, Hip, and Back-Neck length before purchasing fabric. For best results, work with a sewing buddy. Working with knits shouldn’t be daunting or intimidating. First, let’s talk about the recommended fabric for the knit dress: Ponte Knit. Ponte knits are double knits; in simple terms, double the weight of a T-shirt or single-knit jersey. The fiber content of the Ponte knit that I chose is rayon, polyester, and spandex. The weight of this fabric enhances most body shapes, travels without ironing, is colorfast, and is easy to launder. The fabric you choose might include wool or cotton. The key element is to choose a fabric with a minimum of 3%–5% spandex, which gives the fabric shape and retention. Your final fabric consideration must be the stretch. Test the crosswise grain of the fabric by positioning 4″ of fabric along the top back envelope. Stretch the knit to the second position on the guide. The fabric must stretch to the second position on the guide to be suitable to use with this pattern. Note from Nancy: Knits need to be pretreated just as woven fabrics do. Excess finishes need to be removed, and shrinkage needs to be controlled before cutting out the fabric. Prewash your knit fabric using a mild soap or baby shampoo to keep colors bright. Choose an interfacing. For best results, use a fusible knit interfacing, such as Pellon Fusible Easy Knit Interfacing. Since the fabric and interfacing are the same type, they will behave in the same manner when worn and washed. Stretch needles and ballpoint needles are designed with a medium ballpoint tip that prevents snags on knits fabrics. The ballpoint needle works well on sweater-type knits. The eye and scarf of the stretch needle are specially designed to prevent skipped stitches on highly elastic knits such as spandex. For this Ponte knit dress, I’ll be using a Klasse Ball Point Needle, size 80/12. Open the pattern to find the guidesheet page and look for the section that details the pattern pieces needed for the dress view that you’re planning to sew. Find the numbered pieces in the tissue and roughly cut out. Place Pattern Tracing Paper over the multi-sized pattern; trace your size. Then, cut along the traced line with a paper scissors. Before laying out your pattern, determine the pattern size and make any adjustments. Though I’m not covering fitting tips during this sew along, reference my , and/or watch my Fit With Confidence Techniques on YouTube. Open the main dress fabric. Fold each selvage edge towards the middle. Place each piece according to the layout illustration found on the guidesheet. Use pattern weights or pins to hold the pattern tissue in place. If working on a large cutting mat surface, use a rotary cutter to carefully cut along your marked size line. Or, cut out the pattern pieces, using your favorite fabric shears. “Nip” a 1/4″ clip into the seam allowance at each notched mark. Mark the darts by placing a pin at the apex point of the dart, through both layers of fabric. Nip into the seam allowance at each end of the dart legs. Fold the tissue and one layer of fabric to reveal the fabric “wrong side” and the pin. Mark the pin points with a non-permanent marker. Open the yoke fabric completely. Arrange the pattern pieces as described in the guidesheet layout diagram. Keep in mind that the yoke is asymmetrical. It is critical to place the pattern tissue print-side-up on the fabric. Lay out the yoke facing pattern pieces on the interfacing pieces. Make sure the pattern is print side up and the interfacing is adhesive side down. Mark the right side of the asymmetrical yoke with a sticker. Note from Nancy: When working with knit fabrics, it is helpful to mark the right side of the fabric with a small piece of tape. Knit solids can often be difficult to discern right and wrong fabric sides. With all the pieces cut out, you and I will be ready for Part Two of the Nancy Zieman Knit Dress Sew Along, next week. If you have a blog site, website, or online social sewing group, feel free to grab the code and share this button. The hashtag is a searchable “word” associated with an event or activity, which, when searched on popular social websites, like Instagram, Twitter, Flickr, and Facebook, will show every single post using that hashtag. Even if you don’t personally know that seamstress, you’ll see her/his progress and a photo. Hashtags are a fun way to network and connect with people who share similar interests. Don’t forget to pin a picture from this blog post and tell all your sewing friends. The more people who sew along with this project, the more fun it will be. I look forward to sewing along with you! For additional tips on sewing knits, watch Sew Knits with Confidence on Sewing With Nancy online. See the entire Nancy Zieman Knit Dress Sew Along schedule online here. Nancy Zieman—author, pattern designer, businesswoman, producer, and national sewing authority—is the host of the popular show Sewing With Nancy®, which appears exclusively on public television stations across the United States and Canada. 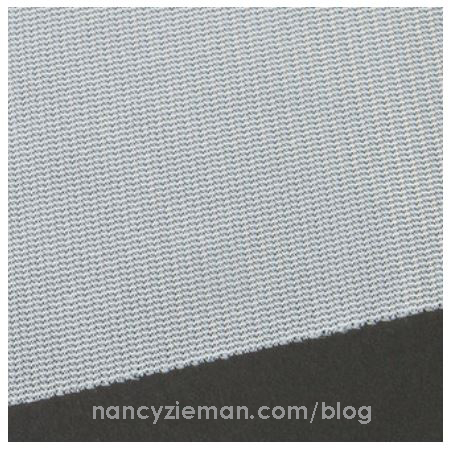 Follow Nancy’s blog at NancyZieman.com/blog and sign up to receive Nancy’s E-News for the latest news in sewing, quilting, and creating. I really like cottons better. Would this pattern work well with a cotton knit at all? I like the look of this book and tape that goes with it. I do alterations for other people and sometimes have to wing it. Would love to really know what I am doing. I think I will look into getting them. They are just what I need. Thanks. I hope you continue to get better. I liked that one ladies idea of thinking of you every time we turn on our sewing machines. Then say a prayer. The power of prayer is an amazing thing. Positive thinking helps too. Take care. So glad you are tackling life’s obstacle’s head on and just a note to let you know you are in my prayers as many of your fans will tell you also. Thank you for all you have taught me. and God Bless. I love everything you do. Unfortunately, I am 5’2 and always have to make so many alterations to a normal-sized pattern. I wish and would love to sew along but it’s so difficult making all required alterations. I so wish companies still made many attractive petite pattern and not the petiteable normal-sized pattern for shorties like myself. This has for the most part ended my garment making. I’ve tried your method of changing patterns, which is very good and easy to follow. So far, I have little success; probably just me. Just lamenting a little. Thanks for reading this. What a nice and simple dress. Perfect for summer. I will have to see if I can include this sew along with my other projects.